Geaghan's is doing something right. They've sold 65,800 pounds of boneless wings, and over 1 million individual wings. Peter Geaghan said that it's all about fresh ingredients. Geaghan thinks two elements in particular set their bone-in and boneless wings apart from the crowd. The first is the homemade blue cheese dressing (which has massive chunks of blue cheese). The other would be their Reserve Sauce - which, if you haven't had it, is a smoky-sweet sauce with a serious but not deadly kick. 'Personally, I'm a bone-in guy. I like them meaty and fatty and all the bad stuff,' he said. And of course, wing sauce can be used in creative ways. The Chieftain is a blending of Geaghan's wings and pub cheese in an omelet; the Chieftain melt is a sandwich version. John Mason, the restaurant manager at Dysart's, said that their chicken tenders remain one of their most popular dishes. 'In the process we use fresh chicken in a brine solution. After that we bread it in our special breading that we mix, but it's the brining process that infuses them with all this flavor,' he said. And for the weekend of the Super Bowl, Dysart's can sell anywhere between 160 to 200 pounds of tenders. 'They hold the heat rather well [but if you need to re-heat them], just pop them in the microwave for a short time, or in the oven on low to give some crisp to them. The oven would be the best bet,' said Mason. He recommends pairing the tenders with your favorite sauce such as ranch or blue cheese - and notes they have a sweet chili sauce that is quite popular as well. 'It's got a little bit of sweet and nice hot spicy kick at the end,' he said. The Roost in Orono is another location famous for their wings. To say that wings are their thing would be something of an understatement. 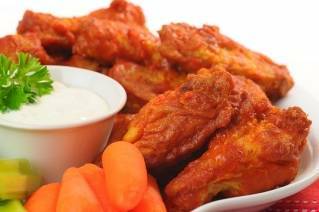 They average approximately 900 pounds of wings on Super Bowl Sunday and 30,000 pounds per year. Coffe noted that The Roost features a new sauce every Tuesday (Wing Night). And they're no stranger to creative dishes. How hot you want your wings is a matter for debate. Geaghan's offers a sauce that ranges from mild to 'ouch' on their menu. Peter Geaghan said that they add minced habaneros in with the regular hot sauce. 'It's pretty mean stuff. I can't do it,' he said. At the Roost, they have the Nuclear Sauce, which features the Ghost Pepper. According to the Scoville Pepper Scale, the Naga Jolokia or Ghost Pepper ranges from 855,000 to 1,041,427 just under pepper spray. If you eat at the Roost, each table comes with a roll of paper towels if things get saucy. 'It's best to just eat them and clean yourself up at the end. That's my style,' he said. If you are bringing the wings home, he suggests picking them up at halftime to eat them hot, but suggests fans can also get inexpensive warmers and trays to keep them warm on a buffet table.